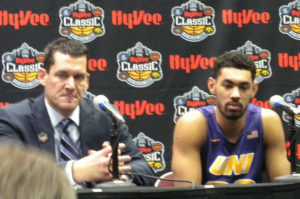 Iowa and UNI face off in the HyVee Classic. The Iowa Hawkeyes clamped down on defense against Northern Iowa and rolled to an easy 69-46 win in the HyVee Classic Saturday. 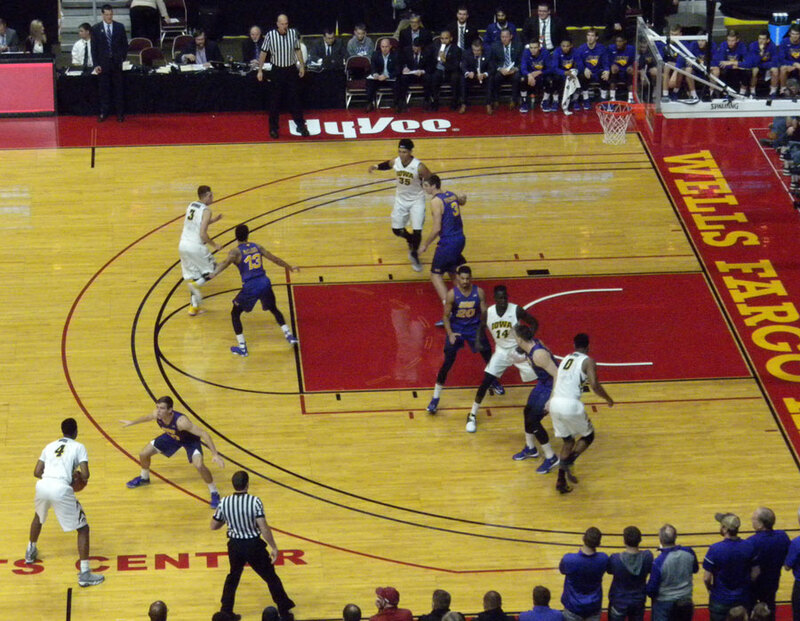 UNI shot just about 27 percent from the field, including just 6 of 26 from three-point range. in their win against Iowa State. He says they’ve bought into playing defense and are talking on defense and their chemistry has been good. Sophomore Nicholas Baer says they’ve worked hard on improving their play on the defensive end. we knew we had to get out on their shooters and also contain the drive — because when they drive and kick they are really effective,” Baer said. “Just really proud of our collective effort as a team.” Jok said the victory over the Panthers was a good one for their confidence. 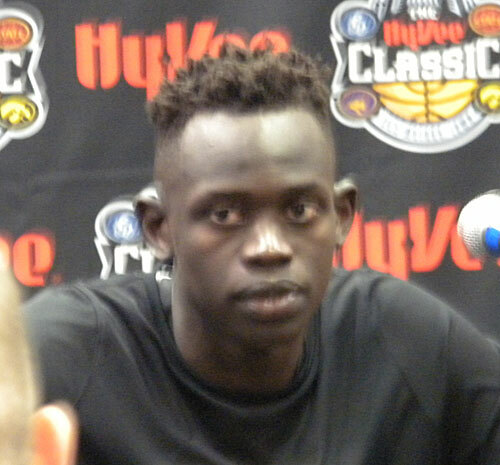 “It just means that we can play at a high level against anybody in the country,” Jok said. While the Panthers had trouble scoring, Jok was making shots all over the floor, including 3 of 3 three-pointers to lead all scorers with 21. Baer came off the bench to score 11 points and chipped in 11 rebounds. He says his mentality doesn’t change whether he is a starter or comes off the bench. “Whenever I go into the game, I’m just trying to impact the game with my energy, just trying to be a good teammate for all my teammates out on the court,” Baer says. 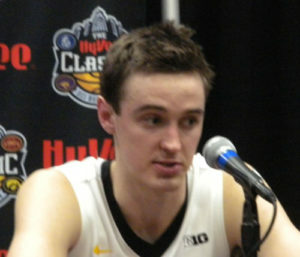 Hawkeye coach Fran McCaffery praised Baer’s effort. “Nicholas Baer is just a special player. Every time he is on the bench I am thinking how I can get him back in. We’ve all seen him kind of go to exhaustion and that’s why we’ve got to take him out,” McCaffery said. He said Baer has the ability to come into the game and get right into the flow, while it takes some guys some time to get going. 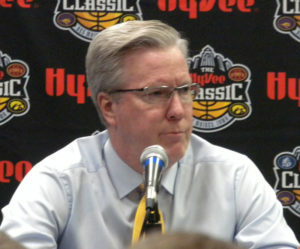 McCaffery said he is pleased with the way his team had improved its defensive play. 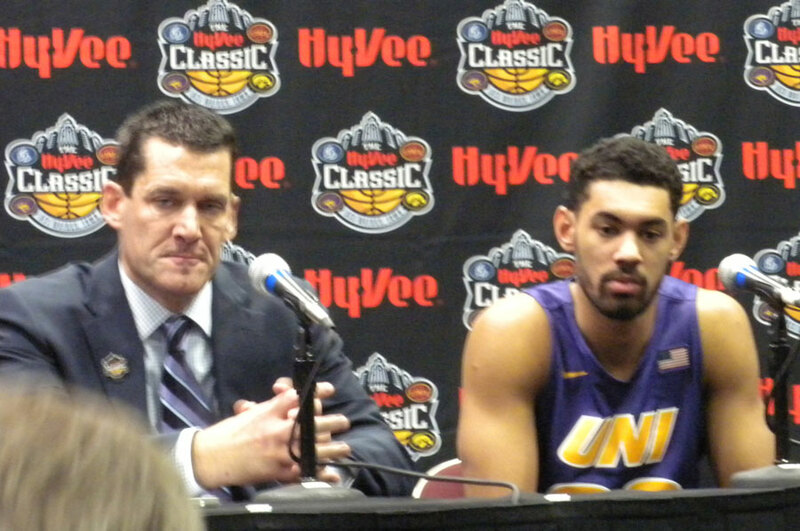 “Our rotations were better, our ball pressure was better, our rebounding was better. Because the thing you know is they are going to defend you and you don’t know always know that you are going to be able to shoot a good number against them. There were a couple of stretches there where we weren’t scoring, but neither were they — and I think that is a big step for us,” McCaffery said. Ben Jacobson and Jeremy Morgan. The Panthers’ Jeremy Morgan was held to one of six three pointers, and says overall they had trouble making shots. “I did think we got a lot of open looks, the looks that we wanted. And when those aren’t falling you’ve got to have a different level of toughness, you’ve got to have even more stops than you were getting before and you’ve got to rebound better. We weren’t making shots and we also weren’t doing those two things,” Morgan says. U-N-I coach Ben Jacobson also though they had a lot of good shots that they didn’t make. He says after you miss those good shots then you’ve got to be able switch gears and drive to the basket or get the ball into the paint and they didn’t do that. “We did not do that tonight and we are going to have to be able to do that going forward,” Jacobson said. Morgan led the Panthers with 14 points. They are now 5-5 on the season, while Iowa moved to 6-5. 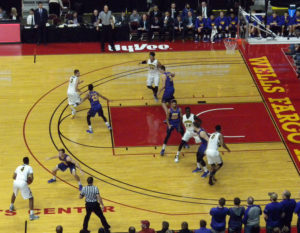 Iowa State pulled away late in the second half to down Drake in the second game 97-80. Drake hung with the Cyclones for most of the game, trailing by 2 at the half. The Bulldogs tied the game at 76-76 before the Cyclones went on a 21-4 run to close it out and get the win. Naz Mittrou-Long set a Wells Fargo Arena record, scoring 37 points for ISU, Monte Morris added 20 and Darrell Bowie had 12. Bill Wampler led Drake with 23 points. The Cyclones are now 7-3 and Drake fell to 1-9.